Dr. Harms is certified by the American Board of Surgery with a certificate of added qualifications in surgical critical care. 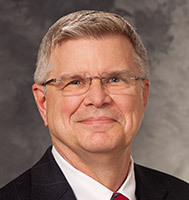 He is the former chief of the UW Hospital’s Section of Trauma and Surgical Critical Care. He also specializes in colorectal surgery for inflammatory bowel disease and other colorectal disorders. Dr. Harms maintains a basic science laboratory that researches the pulmonary microcirculation and pathophysiology of post-traumatic pulmonary edema.